The Flex System™ x440 Compute Node from Lenovo is a four-socket Intel Xeon processor-based server that is optimized for high-end virtualization, mainstream database deployments, and memory-intensive, high-performance environments. This product guide provides essential pre-sales information to understand the x440 Compute Node, its key features and specifications, components and options, and configuration guidelines. This guide is intended for technical specialists, sales specialists, sales engineers, IT architects, and other IT professionals who want to learn more about the x440 and consider its use in IT solutions. Withdrawn from marketing: The models covered in this product guide are now withdrawn from marketing. 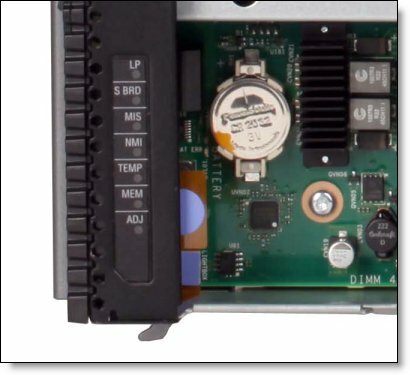 The replacement system is the ThinkSystem SN850 which is described in https://lenovopress.com/LP0638. The Lenovo Flex System™ x440 Compute Node is a four-socket Intel Xeon processor-based server that is optimized for high-end virtualization, mainstream database deployments, and memory-intensive, high-performance environments. Available with Intel Xeon E5-4600 v2 processors, it is price-performance optimized with a selection of processors, memory, and I/O options to help you match system capabilities and cost to workloads without compromise. The Flex System x440 Compute Node can help reduce floor space that is used and lower data center power and cooling costs. Suggested usage: Database, virtualization, and enterprise applications. The following figure shows the Flex System x440 Compute Node. Flex System is a new category of computing that integrates multiple server architectures, networking, storage, and system management capability into a single system that is easy to deploy and manage. Flex System has full, built-in virtualization support for servers, storage, and networking to speed provisioning and increase resiliency. In addition, it supports open industry standards, such as operating systems, networking and storage fabrics, virtualization, and system management protocols, to easily fit within existing and future data center environments. Flex System is scalable and extendable with multi-generation upgrades to protect and maximize IT investments. This section describes the key features of the compute node. The Intel Xeon processor E5-4600 v2 product family improves productivity by offering superior system performance with 12-core processors and up to 3.3 GHz core speeds, up to 30 MB of L3 cache, and up to two 8 GTps QPI interconnect links. Up to 48 DDR3 ECC memory RDIMMs provide speeds up to 1600 MHz and a memory capacity of up to 768 GB. Load-reduced DIMMs (LRDIMMs) are supported with a maximum capacity of 1.5 TB of memory. The use of solid-state drives (SSDs) instead of or along with traditional hard disk drives (HDDs) can significantly improve I/O performance. An SSD can support up to 100 times more I/O operations per second (IOPS) than a typical HDD. Up to 64 virtual I/O ports per compute node with optional 10 Gb Ethernet ports, which offer the choice of Ethernet, iSCSI, or FCoE connectivity. The x440 offers PCI Express 3.0 I/O expansion capabilities that improve the theoretical maximum bandwidth by 60% (8 GTps per link), compared with the previous generation of PCI Express 2.0. With Intel Integrated I/O Technology, the PCI Express 3.0 controller is integrated into the Intel Xeon processor E5 family. This configuration reduces I/O latency and increases overall system performance. 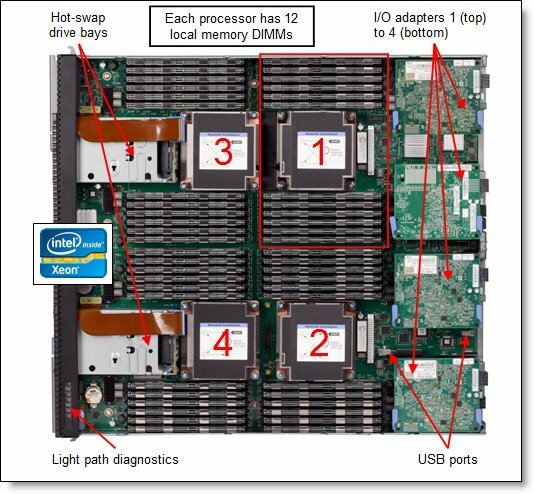 Support for up to four I/O adapters in each x440 Compute Node. Chipkill, memory mirroring, and memory rank sparing for redundancy if there is a non-correctable memory failure. Hot-swap drives that support integrated RAID 1 redundancy for data protection and greater system uptime. A light path diagnostics panel and individual light path LEDs to quickly lead the technician to failed (or failing) components. This panel simplifies servicing, speeds up problem resolution, and helps improve system availability. Predictive Failure Analysis (PFA), which detects when system components (such as processors, memory, and HDDs) operate outside of standard thresholds and generates proactive alerts in advance of possible failure, which increases uptime. SSDs that offer better reliability than traditional mechanical HDDs for greater uptime. An IMM2 to monitor server availability and perform remote management. Integrated Trusted Platform Module (TPM) V1.2 support enables advanced cryptographic functionality, such as digital signatures and remote attestation. Industry-standard AES NI support for faster and stronger encryption. Integrates with the IBM Flex System Manager for proactive systems management. It offers comprehensive systems management for the entire Flex System platform, which increases uptime, reduces costs, and improves productivity through advanced server management capabilities. Fabric Manager simplifies the deployment of infrastructure connections by managing network and storage address assignments. Component-sharing design of the Flex System chassis provides ultimate power and cooling savings. The Intel Xeon processor E5-4600 v2 product family offers better performance over the previous generation while fitting into the same TDP limits. Low-voltage 1.35 V DDR3 memory RDIMMs use 15% less energy than 1.5 V DDR3 RDIMMs. SSDs use approximately 80% less power than traditional spinning 2.5-inch HDDs. The x440 uses hexagonal ventilation holes, which is a part of Calibrated Vectored Cooling technology. Hexagonal holes can be grouped more densely than round holes, which provides more efficient airflow through the system. Form factor Double-wide compute node. Chassis support Flex System Enterprise Chassis. Processor Up to four Intel Xeon E5-4600 v2 family processors, each with 12 cores (2.4 GHz), 10 cores (2.4 GHz), 8 cores (up to 3.3 GHz), or 6 cores (2.6 GHz). Two QPI links, up to 8.0 GTps each. Up to 1600 MHz memory speed. Up to 30 MB L3 cache per processor. Memory Up to 48 DIMM sockets (12 DIMMs per processor) that use Low Profile (LP) DDR3 DIMMs. RDIMMs and LRDIMMs supported. Also, 1.5 V and low-voltage 1.35 V DIMMs are supported. Support for up to 1600 MHz memory speed, depending on the processor. Four memory channels per processor (three DIMMs per channel). With RDIMMs: Up to 768 GB with 48x 16 GB RDIMMs and four processors. Disk drive bays Two 2.5-inch hot-swap SAS/SATA drive bays that support SAS, SATA, and SSD drives. Optional support for four additional 1.8-inch SSDs internal to the compute node. RAID support RAID 0 and 1 with integrated LSI SAS2004 controller. 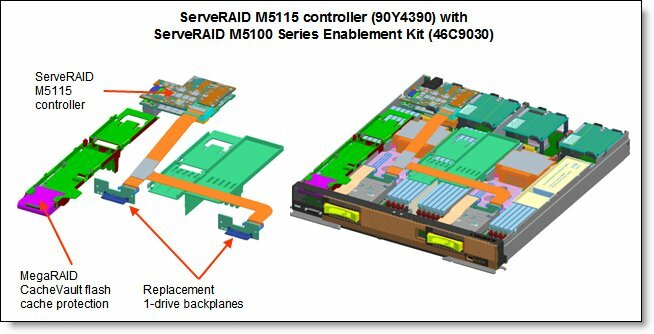 Optional ServeRAID M5115 RAID controller with RAID 0, 1, 10, 5, and 50 support and 1 GB cache. Supports up to four 1.8-inch SSDs with an expansion kit. Optional flash-backup for cache and SSD performance enabler. With 1.8-inch SSDs and ServeRAID M5115 RAID adapter: Up to an additional 3.2 TB with four 800 GB 1.8-inch SSDs (in addition to the storage provided by the 2.5-inch drives). x4x models: Two 10 Gb Ethernet ports with Flex System EN4172 2-port 10Gb Ethernet Adapter, based on QLogic BCM57840 ASIC. x2x models: None standard; optional 1 Gb or 10 Gb Ethernet adapters. PCI Expansion slots Four I/O connectors for adapters. PCI Express 3.0 x16 interface. I/O slots 3 and 4 require the second processor installed. Ports USB ports: One external. Two internal for embedded hypervisor. Console breakout cable port provides local KVM and serial ports (cable standard with chassis; more cables optional). Systems management UEFI, IMM2 with Renesas SH7757 controller, Predictive Failure Analysis, light path diagnostics panel, automatic server restart, and remote presence. Support for Lenovo XClarity Administrator, Flex System Manager, IBM Systems Director, and ServerGuide. Security features Power-on password and administrator's password, Trusted Platform Module 1.2. Video Matrox G200eR2 video core with 16 MB video memory integrated into the IMM2. Maximum resolution is 1600x1200 at 75 Hz with 16 M colors. ** Processor detail: Processor quantity and model, cores, core speed, L3 cache, memory speed, and power consumption. * For model G2x, the standard DIMM is rated at 1600 MHz, but operates at up to 1333 MHz to match the processor memory speed. For models L2x and M2x, the processor's memory channel operates at 1600 MHz to match the speed of the standard memory DIMM. † The 2.5-inch drive bays can be augmented with extra internal bays to support up to four 1.8-inch SSDs. For more information, see the Internal storage section. ‡ The x4x models include the Flex System EN4172 2-port 10Gb Ethernet Adapter. The x440 is supported in the Flex System chassis in the following table. The x440 supports the processor options that are listed in the following table. The server supports one, two, or four processors (three processors is not supported). For a specific processor model (for example, the Xeon E5-4607), there are two part numbers: the first number is for the rear two processors (CPUs 1 and 2) and includes taller heat sinks; the second part number is for the front two processors (CPUs 3 and 4) and includes shorter heat sinks. The table also shows which server models have each processor standard. If no corresponding model (where used) for a particular processor is listed, this processor is available through Configure to Order (CTO) only. * For rows with two feature codes specified, the first feature code is for Processor 1 and the second feature code is for Processor 2. For rows with one feature code, the feature is for Processors 3 and 4. Lenovo DDR3 memory is compatibility tested and tuned for optimal performance and throughput. Lenovo memory specifications are integrated into the light path diagnostic tests for immediate system performance feedback and optimum system uptime. From a service and support standpoint, Lenovo memory automatically assumes the system warranty, and Lenovo provides service and support worldwide. The x440 supports DDR3 memory. The compute node supports up to 48 DIMMs when four processors are installed, with 12 DIMMs for each processor. Each processor has four memory channels, and there are three DIMMs per channel. The following table lists the memory options that are available for the x440 Compute Node. Mixing different types of memory (for example, RDIMMs and LRDIMMs) is not supported. The maximum quantity of DIMMs that can be installed in the server depends on the number of processors that are installed. The following table shows the maximum when all four processors are installed. When two processors are installed, the maximum quantity that is supported is a half of the quantity that is shown. The memory speed that is supported by the specific processor. The lowest of maximum operating speeds for the selected memory configuration that depends on rated speed, operating voltage, and quantity of DIMMs per channel, as shown under "Maximum operating speed" section in the table. The following table shows the maximum memory speeds that are achievable based on the installed DIMMs and the number of DIMMs per channel. The following table also shows the maximum memory capacity at any speed that is supported by the DIMM and the maximum memory capacity at the rated DIMM speed. Cells that are highlighted with a grey background in the following table indicate when the specific combination of DIMM voltage and number of DIMMs per channel still allows the DIMMs to operate at the rated speed. * The maximum supported quantity is shown for four processors installed. When two processors are installed, the maximum supported quantity is a half of the quantity that is shown. When one processor is installed, the quantity is one quarter of that shown. If memory mirroring is used, DIMMs must be installed in pairs (minimum of one pair per processor), and both DIMMs in a pair must be identical in type and size. If memory rank sparing is used, a minimum of one quad-rank DIMM or two single-rank or dual-rank DIMMs must be installed per populated channel. In rank sparing mode, one rank of a DIMM in each populated channel is reserved as spare memory. The size of a rank varies depending on the installed DIMMs. 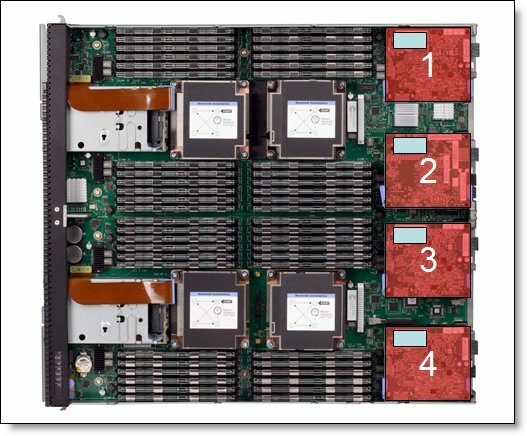 The x440 server has two 2.5-inch hot-swap drive bays that are accessible from the front of the blade server (see Figure 2). These bays are connected to the integrated 4-port LSI SAS2004 6 Gbps SAS/SATA RAID-on-Chip (ROC) controller. The x440 also supports an additional four 1.8-inch drives internally to the server with the addition of the ServeRAID M5115 controller and more SSD tray hardware, as described in the next section. The x440 supports up to four internally-mounted 1.8-inch SSDs in addition to the front-mounted 2.5-inch drives, when combined with a ServeRAID M5115 SAS/SATA controller (90Y4390). The M5115 attaches to the I/O adapter 1 connector. The M5115 cannot be installed if an adapter is already installed in I/O adapter slot 1. The ServeRAID M5115 SAS/SATA Controller (90Y4390) provides an advanced RAID controller that supports RAID 0, 1, 10, 5, 50. It includes 1 GB of cache, which can be backed up to flash memory when it is attached to the supercapacitor that is included with the optional ServeRAID M5100 Series Enablement Kit (46C9030). At least one hardware kit is required with the ServeRAID M5115 controller. The hardware kits which enable specific drive support are listed in the following table. ServeRAID M5100 Series Enablement Kit for Flex System x440 (46C9030) enables support for up to two 2.5-inch HDDs or SSDs in the hot-swap bays in the front of the server. It includes a CacheVault unit, which enables MegaRAID CacheVault flash cache protection. This enablement kit replaces the two standard 1-bay backplanes (which are attached through the planar to an onboard controller) with new 1-bay backplanes that attach to an included flex cable to the M5115 controller. It also includes an air baffle, which also serves as an attachment for the CacheVault unit. MegaRAID CacheVault flash cache protection uses NAND flash memory that is powered by a supercapacitor to protect data stored in the controller cache. This module eliminates the need for a lithium-ion battery that is commonly used to protect DRAM cache memory on PCI RAID controllers. To avoid the possibility of data loss or corruption during a power or server failure, CacheVault technology transfers the contents of the DRAM cache to NAND flash memory by using power from the supercapacitor. After the power is restored to the RAID controller, the saved data is transferred from the NAND flash memory back to the DRAM cache, which can then be flushed to disk. Tip: The Enablement Kit is only required if 2.5-inch drives are to be used. If you plan to install 1.8-inch SSDs only, this kit is not required. ServeRAID M5100 Series SSD Expansion Kit for Flex System x440 (46C9032) enables support for up to four internal 1.8-inch SSDs.The four SSDs are installed on trays above the memory banks. This kit includes two air baffles that can attach two 1.8-inch SSD attachment locations and flex cables for attachment to up to four 1.8-inch SSDs. Note: These kits are specific for the x440 and cannot be used with other compute nodes. The following table shows the required kits for each combination of drives. The following figure shows how the ServeRAID M5115 and the Enablement Kit are installed in the server to support two 2.5-inch drives with MegaRAID CacheVault flash cache protection. Onboard 1 GB data cache (DDR3 running at 1333 MHz) with optional flash backup (MegaRAID CacheVault technology) as part of the Enablement Kit 46C9030. Optional add-ons to the ServeRAID M5115 controller are listed in the following table. The Performance Upgrade for Flex System, 90Y4412, (implemented by using the LSI MegaRAID FastPath software) provides high-performance I/O acceleration for SSD-based virtual drives by using a low-latency I/O path to increase the maximum I/O per second (IOPS) capability of the controller. This feature boosts the performance of applications with a highly random data storage access pattern, such as transactional databases. Part number 90Y4412 is an FoD license. The following tables list the drive options for internal storage. Note: The use of 1.8-inch drives requires the ServeRAID M5115 SAS/SATA controller. The server also supports the 32 GB Enterprise Value USB Memory Key for general portable storage needs. The 32 GB Enterprise Value USB Memory Key offers a convenient delivery option from clients, with key capabilities enabling efficient distribution of large code loads. This key is targeted at workloads that require I/O performance in random read operations. Enterprise Value USB keys have good read IOPS performance, low cost per IOP, but lower endurance and write performance. The following table lists the ordering information for the 32 GB key. Note: The 32 GB Enterprise Value USB Memory Key is not to be used for hypervisors; it is a general-use memory storage device. Alternatively, use the remote media feature of the IMMv2 and the Chassis Management Module. Note: The USB port on the compute node supplies up to 0.5 A at 5 V. For devices that require more power, an extra power source is required. The Flex System EN4172 2-port 10Gb Ethernet Adapter is a dual-port 10 Gigabit Ethernet network adapter and is standard on some models. The adapter supports virtual network interface controller (vNIC) capability that helps clients reduce cost and complexity. 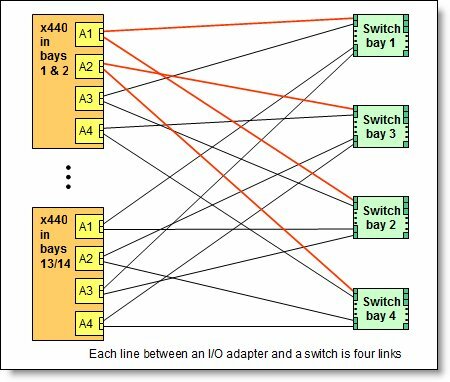 The EN4172 2-port 10Gb Ethernet Adapter is based on the QLogic BCM57840 controller. Connection to either 1 Gb or 10 Gb data center infrastructure (1 Gb and 10 Gb auto-negotiation). The x440 has four I/O expansion connectors for attaching I/O adapter cards, as shown in the following figure. There is a fifth expansion connector (under I/O adapter 4) that is designed for future expansion options. The I/O expansion connector is a high-density 216-pin PCIe connector. 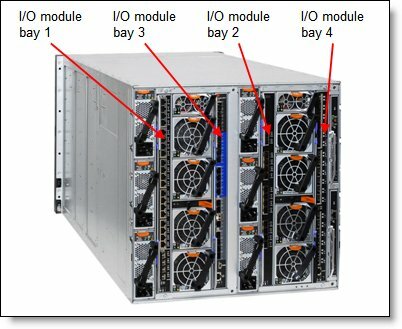 Installing I/O adapters allows the server to connect with switch modules in the Flex System Enterprise Chassis. Each slot has a PCI Express 3.0 x16 host interface and all slots support the same form-factor adapters. Note: A second processor must be installed to use I/O adapter slots 3 and 4 in the x440 compute node because the PCIe lanes that are used to drive I/O slots 3 and 4 are routed to processors 2 and 4. Figure 6 shows the location of the I/O expansion connectors. All I/O adapters are the same shape and can be used in any available slot. A compatible switch or pass-through module must be installed in the corresponding I/O bays in the chassis, as indicated in the following table. Installing two switches means that all ports of the adapter are enabled, which improves performance and network availability. The following figure shows the location of the switch bays in the Flex System Enterprise Chassis. The following figure shows how 2-port adapters are connected to switches installed in the chassis. Most models of the x440 do not have an Ethernet adapter standard; therefore, you can select the adapters that best suite your network. The following table lists the supported network adapters and upgrades. Adapters can be installed in any slot. However, compatible switches must be installed in the corresponding bays of the chassis. The following table lists the storage HBAs that are supported by the x440 server. Server power is derived from the power supplies that are installed in the chassis. There are no server options regarding power supplies. The x440 supports the ESXi hypervisor on a USB memory key via two internal USB ports (see Figure 3). The supported USB memory keys are listed in the following table. Having two keys installed provides a backup boot device. Both devices are listed in the boot menu, which allows you to boot from either device or to set one as a backup if the first device becomes corrupted. The supported USB memory keys are listed in the following table. Note:The 32 GB Enterprise Value USB Memory Key (part number 00ML200) is not to be used for Hypervisors. The Fault LED on the front panel. The light path diagnostics panel. LEDs that are next to key components on the system board. The x440 light path diagnostics panel is visible when you remove the server from the chassis. The panel is located at the upper right side of the compute node, as shown in the following figure. To illuminate the light path diagnostics LEDs, power off the compute node, slide it out of the chassis, and press the power button. The power button also serves as the light path diagnostics remind button when the server is removed from the chassis. The meanings of the LEDs are listed in the following table. MIS A mismatch occurred between the processors, DIMMs, or HDDs. MEM A memory fault occurred. The corresponding DIMM error LEDs on the system board are also lit. ADJ A fault is detected in the adjacent expansion unit (if installed). The server contains an IMM2, which interfaces with the advanced management module in the chassis. The combination of these two components provides advanced service-processor control, monitoring, and an alerting function. If an environmental condition exceeds a threshold or if a system component fails, LEDs on the system board are lit to help you diagnose the problem, the error is recorded in the event log, and you are alerted to the problem. A virtual presence capability comes standard for remote server management.